I've made us tomatoes stuffed with rice! But not just rice, cause that wouldn't be worth all the exclamation marks I'm about to use. Feta cheese or nutritional yeast – depending on your mood or what you love to eat. I've opted for both more than once. So guys, this rice. As you might have noticed, there is a serious lack of rice recipes on the blog. Now that I've found a rice blend that I totally LOVE, expect to see a whole lot of rice popping up around here. Floating Leaf makes three rice blends they call Prairie Blends. 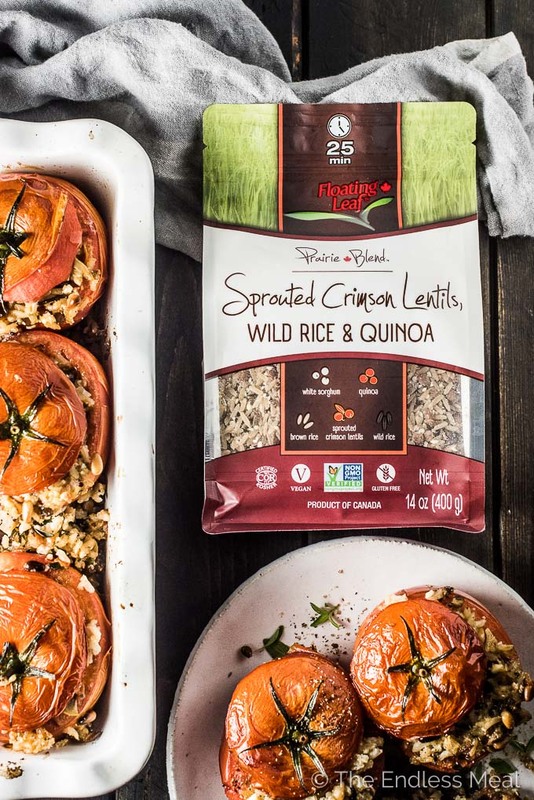 The one I've used to make these stuffed tomatoes is their Sprouted Crimson Lentils, Wild Rice, and Quinoa Blend. Floating Leaf's Prairie Blends are a great way to add plant-based protein to your meal. They're gluten-free so perfect if you're celiac or sensitive to gluten. Cut the tops off the tomatoes and use a little spoon to hollow the insides. Don't worry about making the tomatoes pretty or perfect looking. Just scoop out the center and pop them in a baking dish. Keep this simple! And make sure to save the tomato bits you've scooped out, you'll chop some and add it to the rice. After you saute some onions and garlic until your house smells amazing, add the Prairie Blend and some broth, cover the pan, and let it cook for 20 minutes. 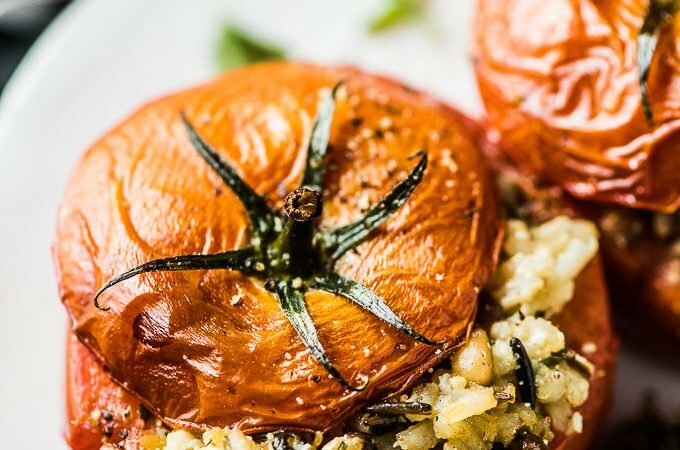 Now toast the pine nuts, chop the dates, olives, and parsley, and decide whether you're making vegan stuffed tomatoes or using feta cheese. When the rice is soft, mix in all your tasty extras and stuff it into the tomatoes you hollowed out. Depending on how big your tomatoes are, you may have a little extra rice. Either fill the tomatoes super full, add the extra rice around the tomatoes, or save the rice for a little lunch tomorrow. Or better yet, give everyone hanging around your kitchen a little bite to tease them with what you're making for dinner. 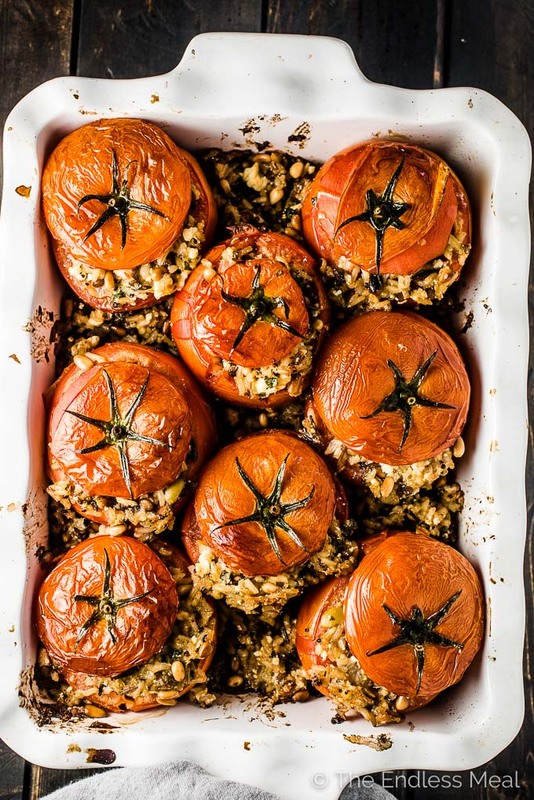 Now all you have to do is pop the filled tomatoes into your oven and let them roast until they're soft and totally irresistible. 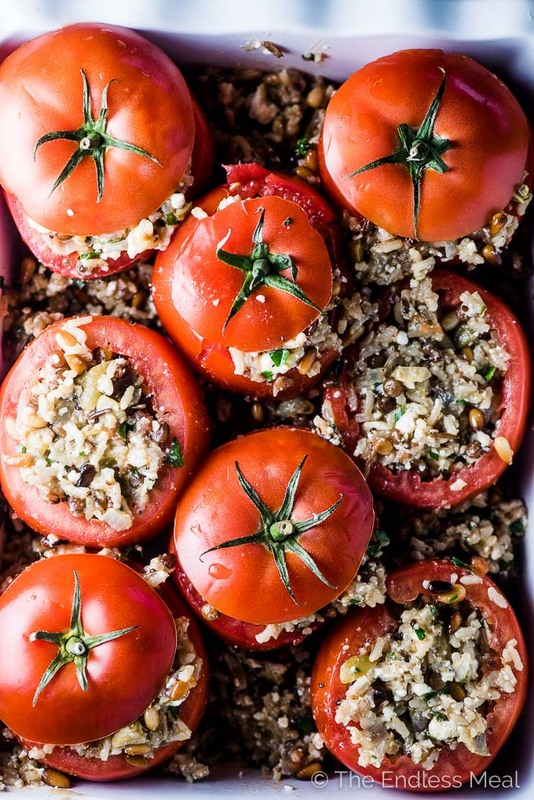 I love meals (like these stuffed tomatoes!) that give me a break between the hands on cooking time and the time we sit down to eat. It's the perfect opportunity to pour a glass of wine/clean up the kitchen/relax with my family before dinner. 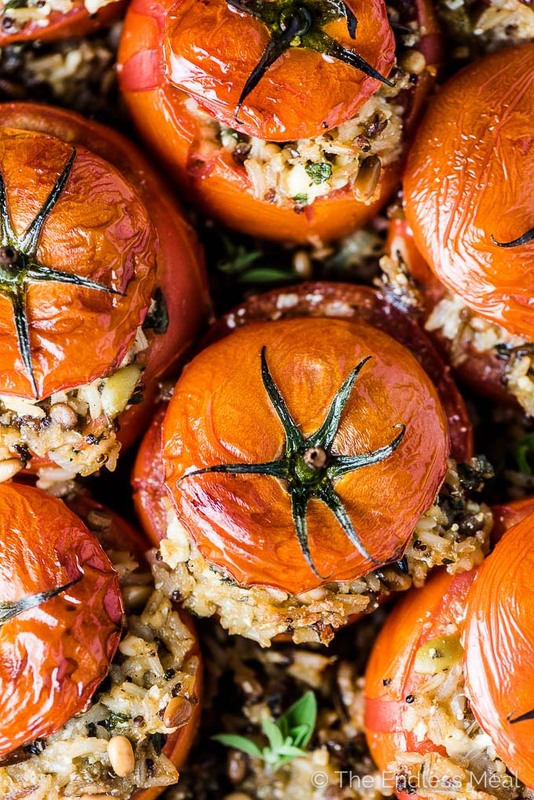 Are these stuffed tomatoes better warm or cold? Looking for some unique options for a vegan graduation party? These are absolutely gorgeous! 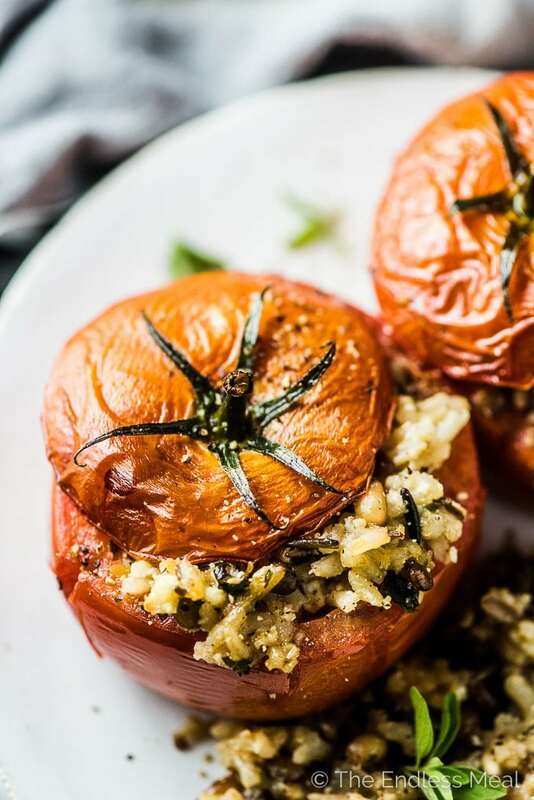 It’s like you read my mind- I’ve been looking for a stuffed tomato recipe! Greek food is AMAZING. Their roasted tomatoes, falafels, warming pita bread, grilled vegetables, fresh Greek salads, and best of all–THEIR SPREADS. HUMMUS, BABAGANOUSH. YES. Anyhow, I have never made stuffed tomatoes myself–only stuffed peppers and acorn squash–but I would love to try it! Combining rice and tomatoes may be unlikely, but I did eat it once and I LOVED it. I can’t imagine this dish not being phenomenal! I lived in Rome when I was 10-13. During our first month there in a temporary lodging, a cook made my first stuffed tomato and I was totally in love. These were with ground beef and that’s what I want to replicate and CANNOT find! I don’t have a stuffed tomato recipe with ground beef, although it sounds amazing! 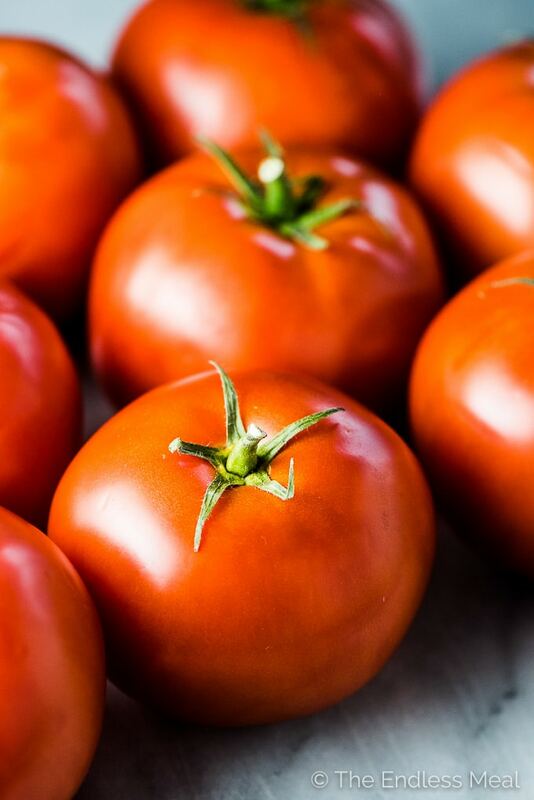 I bet if you added some cooked ground beef to the rice mixture that these tomatoes would be even more delicious! Oh my word!! This is seriously such a showstopper! I can’t wait to try it. I’ll have to beg my mom for some of her amazing homegrown tomatoes for this. But even if she doesn’t have enough anymore, that Floating Leaf rice filling looks so amazing just by itself too! Garden fresh tomatoes are so good, aren’t they? Honestly, though, the rice is so good that even with storebought tomatoes this is delicious. That rice blend is expensive and it seems, not locally available. The recipe looks very good. Any chance for what one could use if one does not want to spend $13+ on a packet of rice? Oh my goodness…this looks amazing. I never would have thought to put all these ingredients into rice. Can’t wait to try it! 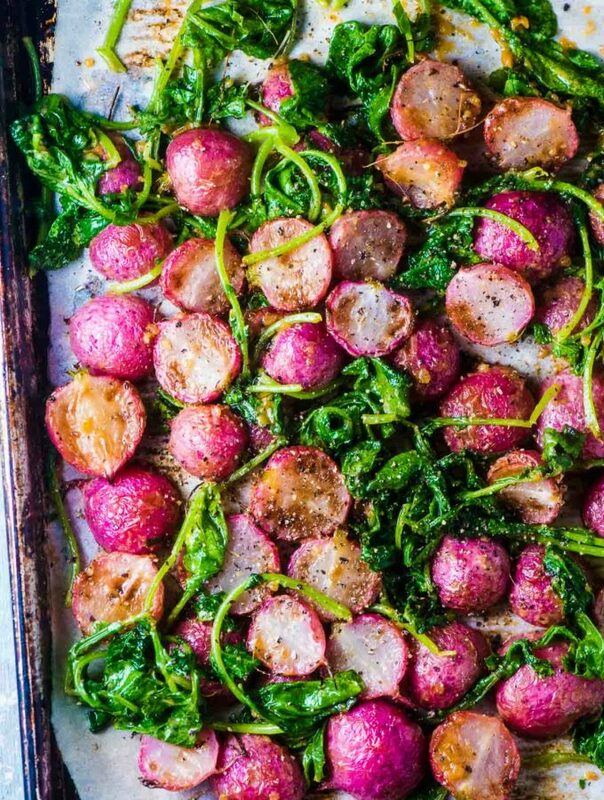 Oh girl you CRUSHED this recipe! So, so good. How friggin’ perfect are these tomatoes? What a gorgeous side, just in time for the holidays! 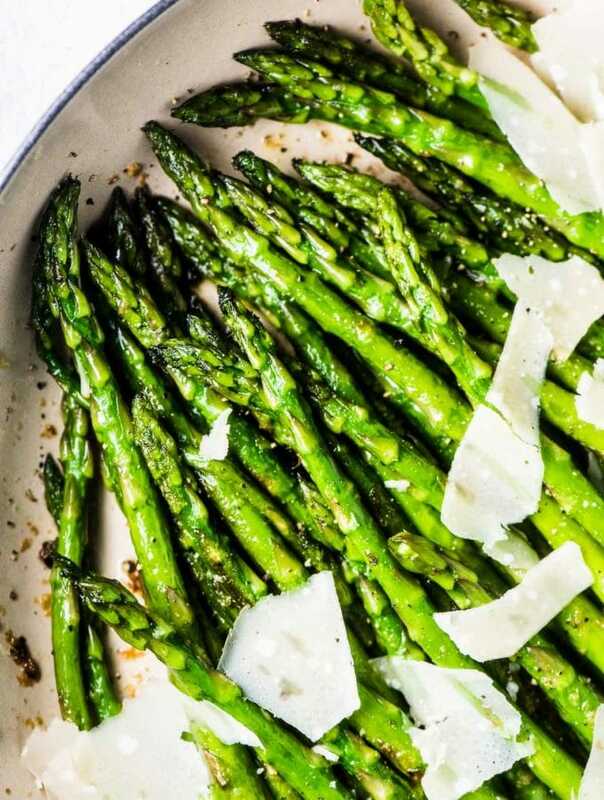 They look so warm, juicy, wholesome, and substantial. I am all over this, and that rice blend is perfection. I’ll be serving them for Thanksgiving for sure! I love everything you added to these! What a flavorful and delicious blend. I can’t wait to try these. I’m so excited about the Floating Leaf brand because I’m a huge fan of rice! I love all the goodness in their blends and it was brilliant to use it as a stuffing for tomatoes. Gorgeous photos Kristen! Don’t they make the best rice ever? I’m absolutely loving it! I love this idea!! It’s a perfect recipe for the transition between summer and fall and I bet the rice blend goes so well in it! Amazing, Kristen! Love the addition of those green olives. I’m definitely trying this one! I’m a huge fan of olives! 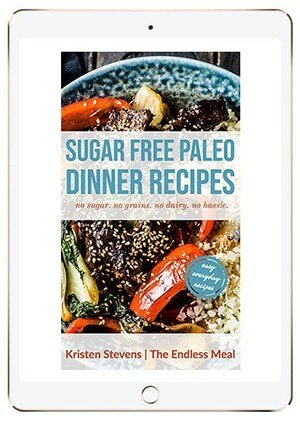 These are all my favorite ingredients, Kristen, and it looks so utterly fabulous! Rice and tomatoes are such a natural combination. Mine too! The work so well with Floating Leaf’s rice blend!! OMG, I just made stuffed peppers the other day for the blog, wish I’d had some Floating Leaf grains, they look amazing. 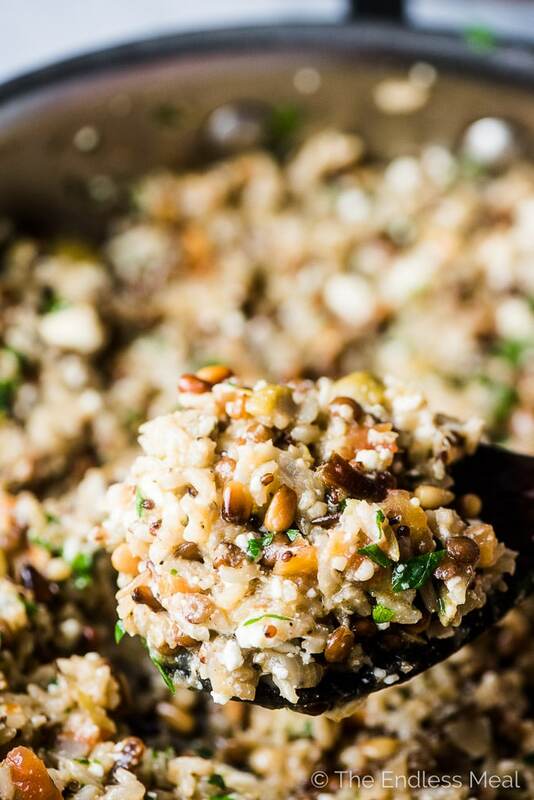 Wild rice always elevates a dish, and this would be so nice on a holiday table. Floating Leaf seriously makes the best rice blends. Wild rice all the way!